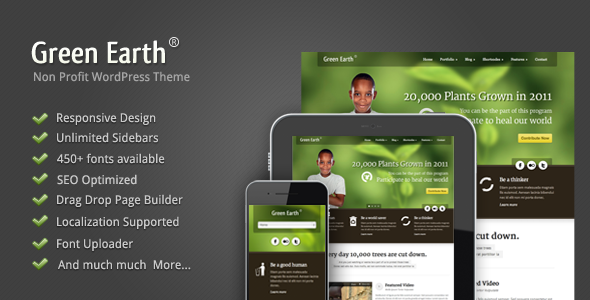 Green Earth is a non-profit WordPress theme. It’s really well designed to best fit the business and non-profit organization that need environmental style. It comes with a new feature ‘Custom Slider’ which allow you to manage slider freely. You can add HTML caption in it and yes, we also provide a demo snippet within the document . You can discover many awesome features in this theme. With ‘Page Builder’ in this theme, allow you to create pages easily by drag-drop module. Moreover, it comes with many options on that. The admin panel in this theme is real feature rich. You can also create unlimited sidebar, choosing over 450 fonts or if you want to use your own, we provide a cufon uploader. You can also translate each elements to your language via this admin panel. SEO We reconstructed about how to use title. We use heading tag(H1,H2,H3,…) for title which is good practice for search engine site. Main contents are moved above sidebars(including both sidebar layout), now search engine will easily fine your main contents first. Also, ‘alt’ tag for images is supported. This is also help search engine to analyst your site easily. Share the post "Green Earth – Environmental WordPress Theme"